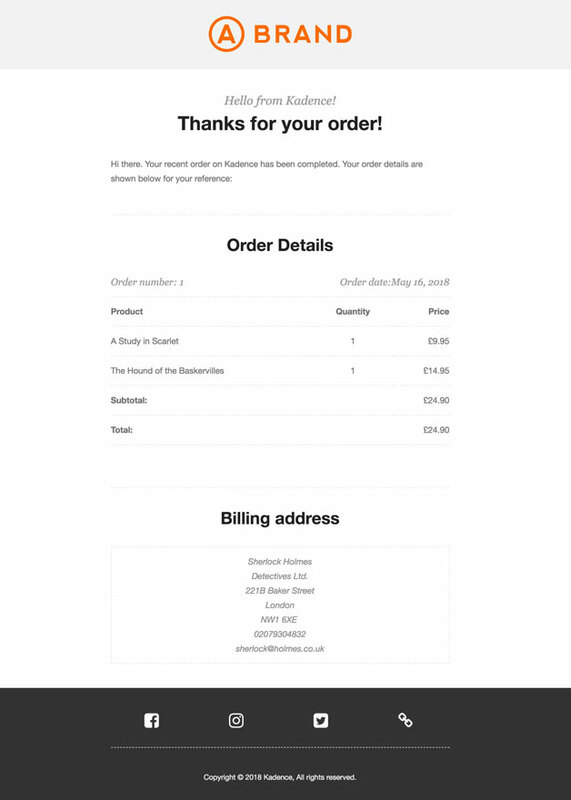 Simple and Powerful design control for WooCommerce Emails. Get a glimpse of how much you can customize with this plugin. 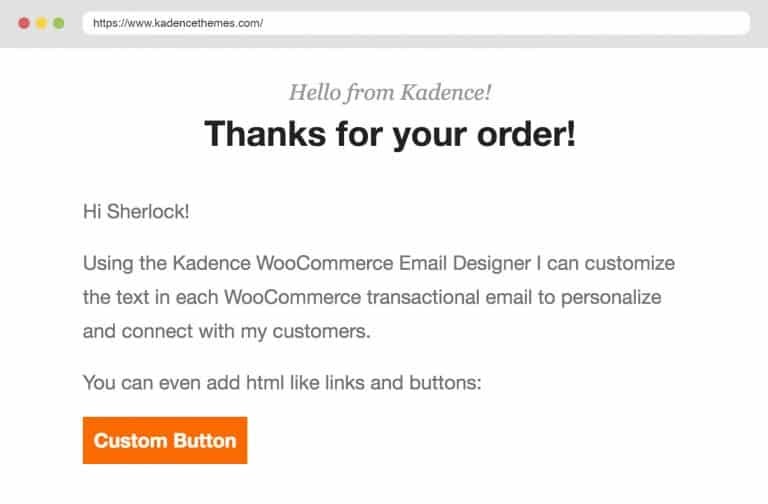 This plugin lets you easily customize the default transactional WooCommerce email templates. Edit the design using the native WordPress customizer for instant visual edits. 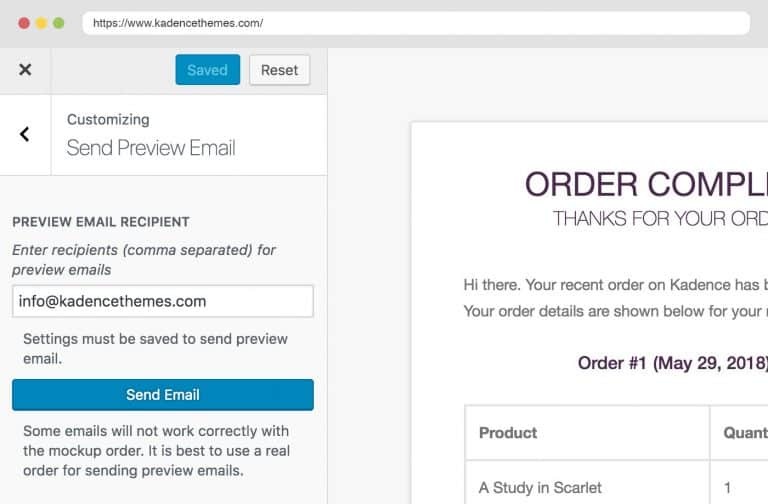 Customize the text (including body text) or each email template in WooCommerce without editing code. 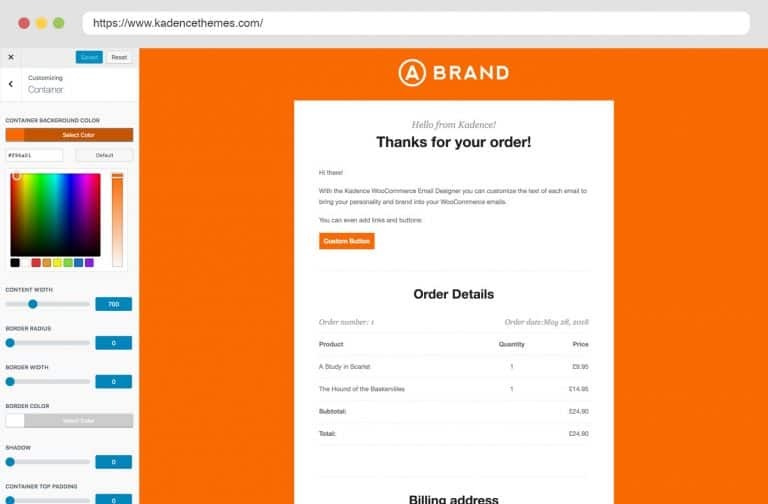 Send emails that make an impression and represent your brands personality and style by customizing them to your unique store. Easily control colors, fonts, background borders and so much more. Quickly and easily browse WooCommerce transactional emails, preview and send based on email type and store order. Know what your emails look like in real inboxes and different devices. Don't just send bland emails with text that sounds like a template. 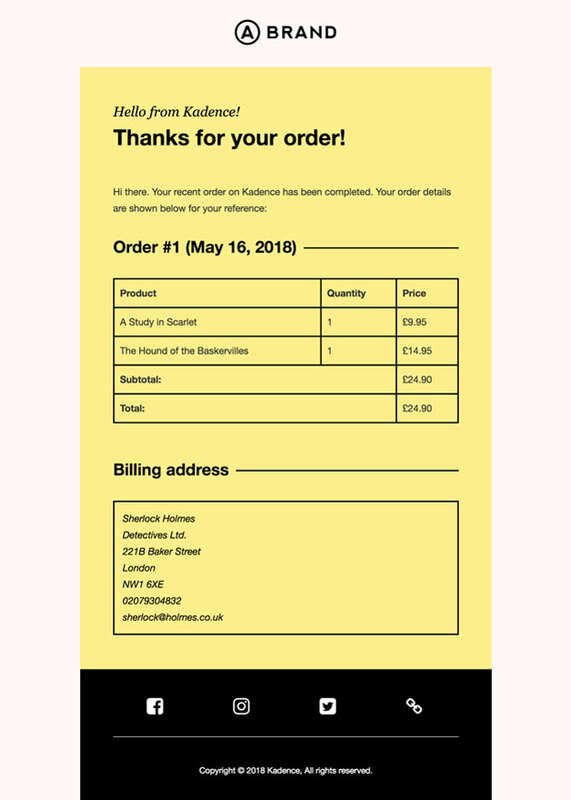 Customize the heading, subtitle and body text of each email to convey the personality behind your brand. We've included several unique designs to get you started. You can easily import with one click. Plus you can export and import designs from test sites to your live site with built-in tools. The plugin is very simple and practical to use. The results are very beautiful and well done. Strongly recommend that you test and see with your own eyes. No need to know how to program, the controls are very practical and well explained. Glad I found you. Congratulations!! What a pleasure to use this plugin and judging by the support forum, outstanding support too, especially when you consider they are not getting paid. Wish all free plugins were like this! No, the full plugin is free and we are improving it all the time. If you have suggestions for new features please send out way info@kadencethemes.com. 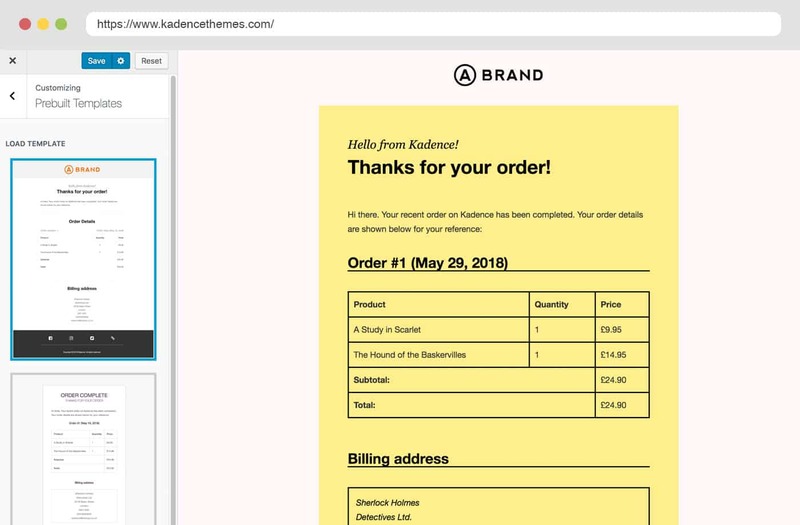 What extra WooCommerce extensions are supported? 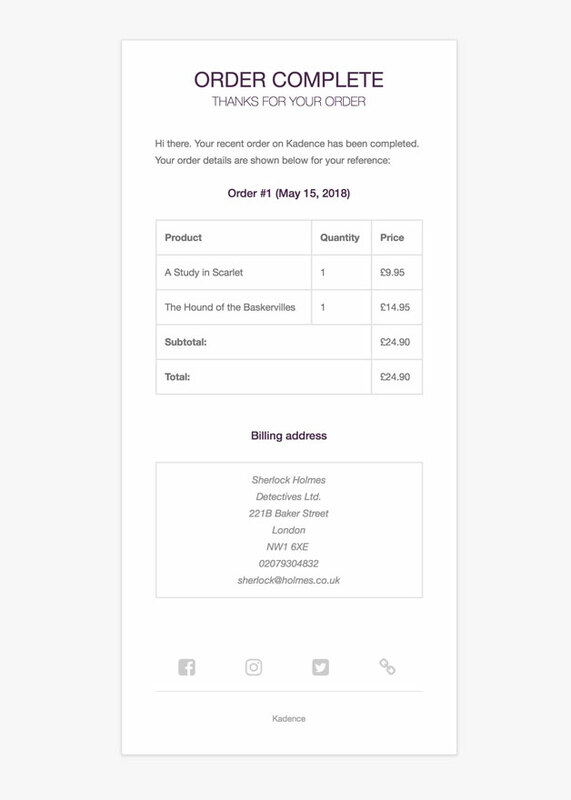 We added full support to preview and edit text in WooCommerce Subscriptions Emails. If you are using another WooCommerce extension that uses it's own extra transactional emails the design you create in our plugin will still apply to those emails. You just won't be able to edit the text or preview those emails. If you have a plugin you would like us to add support for please send us your request info@kadencethemes.com.